Your immersive experience will proceed with an onsite tasting of prestigious dishes: The Honey of Paris, a selection of sliced cheeses, fresh fruits and champagne while enjoying a breathtaking view of the most beautiful monuments of the Capital. 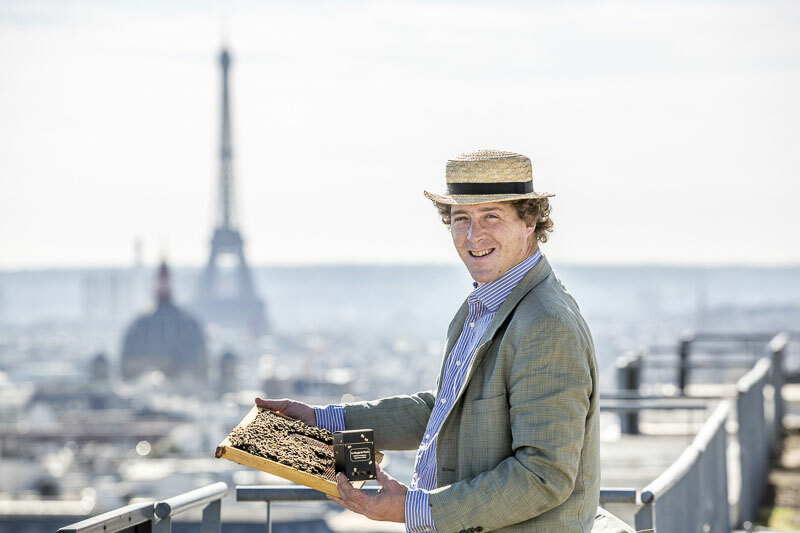 The Honey of Paris is a rare and prestigious product. 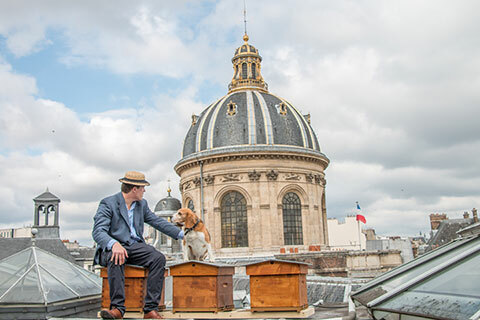 Thanks to the specificities of Parisian flowers and their precious nectars, the Honey of Paris has an incomparable flavor to other honeys. In the nose, a powerful and persistent scent of blackcurrants and tender cherries. On the palate, a nice roundness with a lively and fresh finish. Ideal with a mature Comté, a Pecorino or goat’s milk cheese. 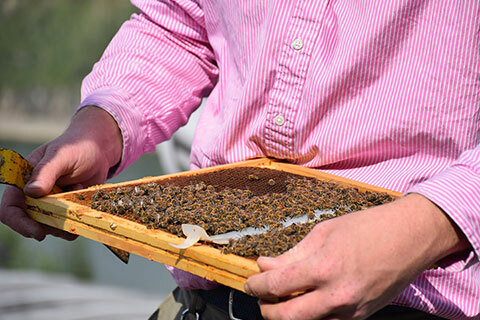 Audric will be delighted to share his passion for beekeeping with you, and answer all your questions. Not suitable for people with vertigo or fear of heights. Access to some rooftops may require taking a staircase. Compulsory identification (national identity card, passport, driver’s license) or valid residence permit. 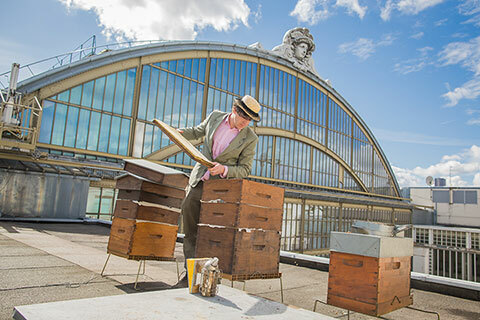 Access to the roof and opening of the hives are subject to the vagaries of the weather. Consequently, cancellation or modification may be proposed depending on the situation. Similarly, the choice and access to the premises are subject to the security restrictions in force and to their availability. Please do not reproduce or re-use for any purpose, any visuals without the prior written permission of the organizers. We request that you respect with discretion, any information communicated in order to preserve the tranquility of the sites and out of respect for the organizers offering us the opportunity to access these sites. 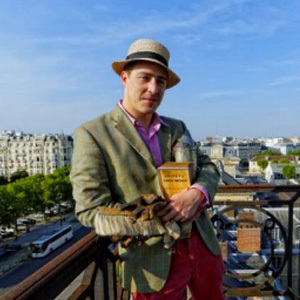 Born in Paris in 1983, Audric has always been passionate about nature. Since the age of 15, he has cultivated and grown vines and vegetables organically in Champagne. He entered the world of beekeeping in 2004, immediately falling in love with these fascinating insects and their delicate productions. 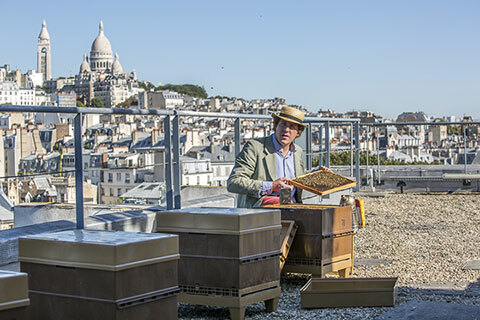 It was in 2010 that he set up his first hives in Paris and was astonished by the high purity and unique flavor of the honey from his harvest. He proposes that you taste the fruits of his labor attributed to the work of “his girls”, in the heart of the city of lovers, in gardens rich in precious nectars embodying their prestigious hosts.